The Fairmon Pacific Rim Hotel Vancouver. The doormen opened the doors with a smile and a “Good Afternoon” as I entered the Fairmont Pacific Rim Hotel in Vancouver. As the doors opened, I found myself in a cavernous lobby with a shining marble floor and an impressive marble wall which ran the length of the lobby. I made my way to the Reception where I was greeted by a lovely receptionist. “Your room is ready Mr. Jenkins”, she said. Her eyes shifted back to the computer screen and after a few moments, she added, “If you could wait fifteen minutes, I have another room for you which has a better harbour view. Believe me, it’s worth the wait.” Now, that sounded promising! “Sure, I can wait fifteen minutes”, I replied excitedly. Fifteen minutes later, I stood at the window in my room totally transfixed as I took in the view. It was simply phenomenal! The blue expanse of Coal Harbour stretched out below me and on the other side, the shores of North Vancouver and a range of mountains, including the famous Grouse Mountain, formed an impressive backdrop. I peered to my left and spotted the forested edges of Stanley Park whilst on my right, the Vancouver Cruise Terminal, with its iconic sail-shaped roof, loomed large. I gasped. The receptionist was absolutely right: this view was definitely worth the wait! The harbour view from my room. The view across to Stanley Park and the Lion’s Gate Bridge. In the far distance, you can see the ‘Lions’, two snowy peaks from which the bridge derives its name. 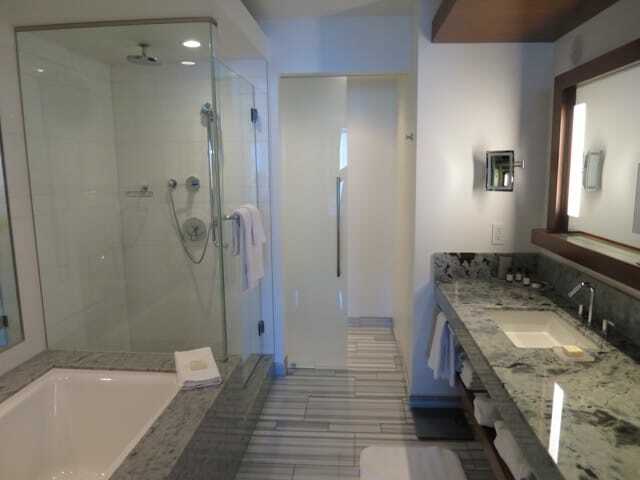 The Fairmont Pacific Rim Hotel Vancouver is a five-star luxury property with 377 rooms. 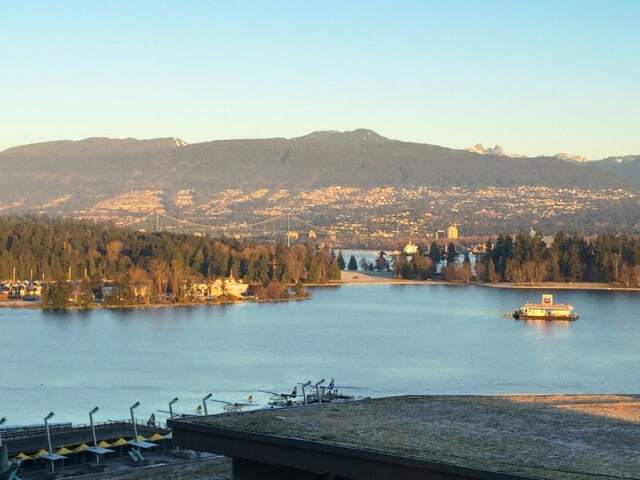 The hotel stands tall next to the Vancouver Convention Centre and many rooms offer incredible views of Coal Harbour and the North Shore Mountains, or the city skyline. The hotel is home to a large variety of facilities including the Willow Stream Spa, a fitness centre and pool, and three dining options: ORU (food of the Pacific Northwest with flavours of the Pacific Rim), The Lobby Lounge and Terrace, including the OceanWise-certified RawBar (a sushi bar) and giovane, an Italian café and bakery. My room was very spacious, with an equally spacious marbled bathroom. When I finally managed to peel my eyes away from the stunning view, I found an incredibly comfortable Stearns & Foster bed, a working table and chair, a large bathroom with mist-free mirrors and built-in television screen (I love them as I can watch the news as I brush my teeth! ), a bathtub and a separate shower cubicle. On the working table, I found an iPad which was my connection to all the hotel’s facilities. I could use it to book a spa treatment or a table at ORU, order room service or simply to check the weather forecast. I especially loved the gorgeous champagne tones, luxurious fabrics and blend of contemporary furniture with woody elements. My room with the harbour view. The iPad connected me with the hotel’s facilities and services. A lovely touch: the welcome email. The service was superb: from the doormen and the concierge to housekeeping and the restaurant personnel, everyone was always ready to assist in my every need. One particular service I liked was the welcome message I received via email on the day of my arrival, which offered me the opportunity to check-in even before stepping into the hotel! Evenings at the Lobby Lounge were a glitzy affair, with live music and fabulous cocktails. It soon became clear to me that this was the place to see and be seen in Vancouver! It was a treat to sit there and watch the well-coiffed ladies and smartly-dressed men sipping on colourful cocktails as I indulged myself with fabulous sushi from the RawBar. The last thing I did every night before jumping into bed was to check out the twinkling lights of passing ships in Coal Harbour and the North Shore. The minute I woke up the next day, I would open the curtains and gawk once more at the phenomenal view. One morning, I drew open the curtains to find a curious-looking cloud hanging low over Coal Harbour, an astonishing sight! One morning, I woke up and this was my view! 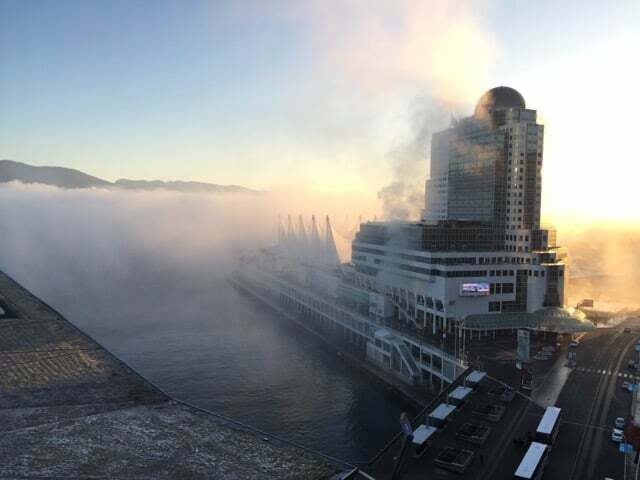 The morning fog that hanged low above Coal Harbour. 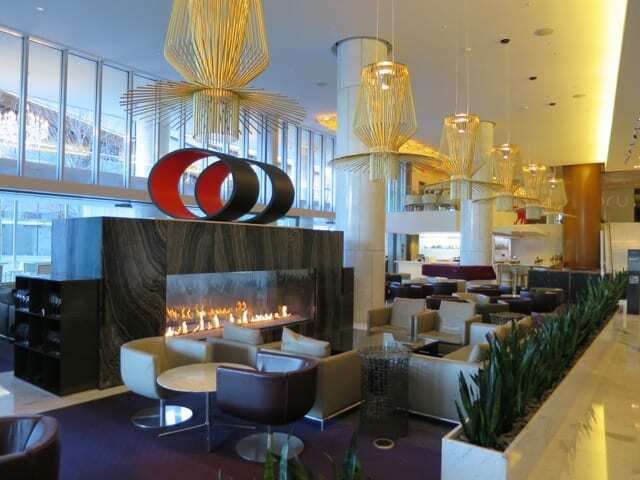 The hotel is centrally-located next to the Vancouver Convention Centre, the beautiful Waterfront and other major Vancouver attractions. The boulevard that runs along the length of the Waterfront is perfect for a morning stroll or jog. The major shopping areas like Robson Street are a few blocks away whilst the historic Gas Town district is about a ten-minute walk away. 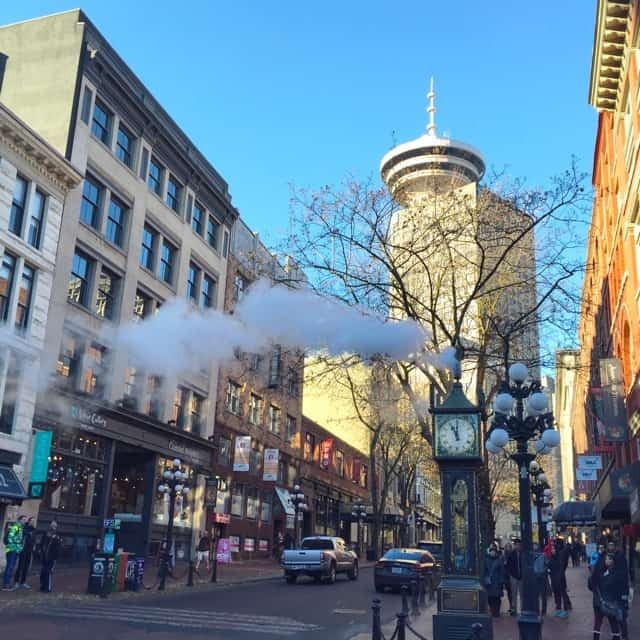 The historic Gas Town in Vancouver, with the famous Steam Clock. Read about my recommendations for some of the best restaurants in downtown Vancouver. Note: a big thank you goes to Fairmont Pacific Rim Hotel, Vancouver and Destination British Columbia for your fabulous hospitality. As always, all views expressed above are mine and mine only. Thanks for your comment. I can highly recommend a stay there. 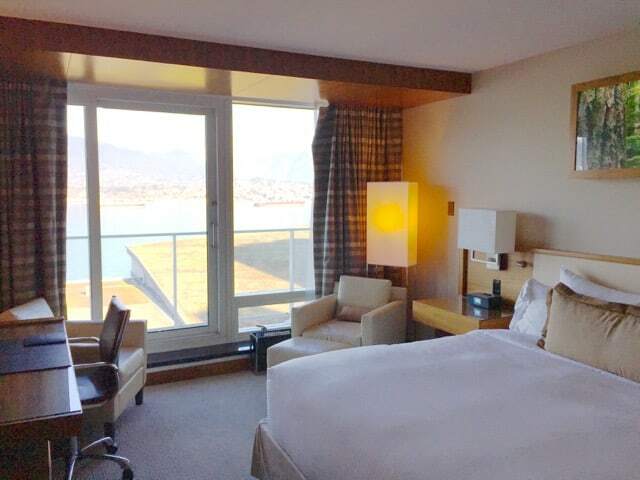 Get a harbour view room – it really is worth it! Seems like a choice spot to experience one of Canada’s best cities … will have to stay there someday!